Hamilton will take on Dundee United in the Ladbrokes Premiership play-off following a thumping 4-0 win over Dundee at the SuperSeal Stadium. 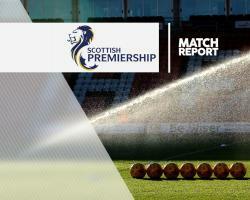 The Lanarkshire outfit started the last league game of the season one point above bottom side Inverness but striker Rakish Bingham and defender Ioannis Skondras scored in a two-minute spell midway through the first half to ease the nerves. Winger Dougie Imrie scored from the penalty spot in the 56th minute and midfielder Ali Crawford drove in a fourth to secure Hamilton's biggest victory of the season. Martin Canning's side will go to Tannadice on Thursday night before the home game next Sunday, while Inverness will start next season in the Championship despite beating Motherwell 3-2. Caley Thistle boss Richie Foran had claimed all the pressure had been loaded on to Accies after the Highlanders had beaten Dundee on Wednesday night. The Hamilton camp had refuted the assertion but it was the visitors who missed the first real chance in the 20th minute. A loose cross-field pass from Hamilton left-back Scott McMann was intercepted by Faissal El Bakhtaoui who played in Paul McGowan but his angled shot was beaten away by Accies goalkeeper Remi Matthews. Skipper Michael Devlin leapt above Dundee keeper Scott Bain to get his head on a Crawford corner and in a busy six-yard box Bingham forced it over the line. The relief was palpable and that feeling turned to glee when Skondras picked up a David Templeton flick just inside the penalty area, thrashed it past Bain and in off the bar for his first goal since joining the club in January. McGowan flashed a drive across the Accies goal and out for a goal-kick and Kevin Holt hit the side-netting with a 25-yard free-kick as the Taysiders, who had brought on Craig Wighton for Nick Ross, tried to respond. Devlin went off with an injury in the 37th minute to be replaced by Massimo Donati but Accies remained solid. Indeed, it took great save from Bain just before the break to thwart a drive from former Rangers winger Templeton, who on Friday had signed a new deal until the end of next season, following a short-term deal. Dundee boss Neil McCann replaced Marcus Haber with Henrik Ojamaa for the start of the second half and minutes later Bingham, back defending a corner, kicked away a goal-bound effort from Kostadin Gadzhalov. In the 56th minute McGowan tripped Templeton as he tricked his way into the Dundee penalty area and referee Crawford Allan pointed to the spot, Imrie slamming the ball past Bain from 12 yards. Accies could relax a little but had Matthews to thank for a fine save from a Holt header. However, in the 76th minute following a swift break, Danny Redmond played in Crawford who drilled his shot from 12 yards low past the helpless Bain, allowing the home fans to enjoy the final stages, before they, like the players, re-focus next week on Dundee United.